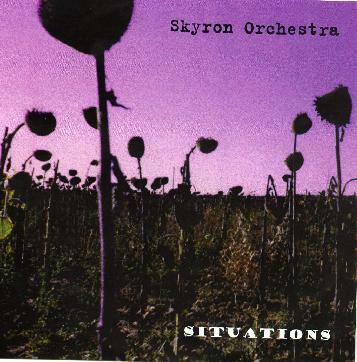 This is the Skyron Orchestra's second CD and it is an improvement in a good direction! The band opens with an amazing psychedelic rock track with cool organ and guitar. This is very much like some of the Mandra Gora Lightshow Society stuff. Great song. Sacred Atmosphere was a bit more of a mainstream. Out Of My Mind is a real trip back to the 60's. Looking For A Trace changes a bit as the organ that most of the songs is driven by is exchanged with a low mixed electric piano. This young band plays really well and has some excellent well crafted songs. The lead vocalist, Veronica, has quite a special voice. Not sure what it is about it. My World Salvation is a bit darker in feeling but a cool song. Call Their Names has quite a cool heavy riff. Veronica, she really reminds me of the woman from the Growing Seeds (but with less delay on her voice). Life Cycle is a short track but one of my favourites. I wonder if these guys jam at all live??? The more I hear the record the more I realize these guys sound a lot like the now defunct Growing Seeds from Germany but much less jamming and psychedelic but still cool. Great band.